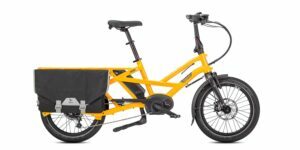 Rad Power Bikes has updated their RadCity high step bike for 2019 and they were kind enough to invite us up to Seattle this year to review their offerings. 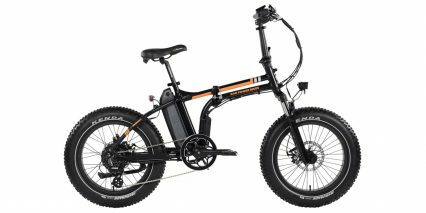 This commuter bike is one of Rad Power’s most popular products, as it can be configured to fit a wide range of needs coming in both a 16” and 19” frame. 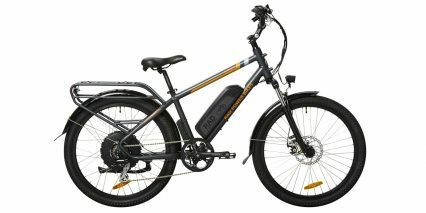 If you have seen this bike before, then the first thing you notice is some of the recent features. 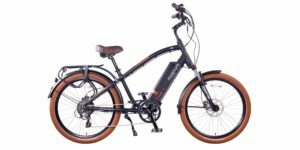 New for 2019 is an adjustable angle stem with mid-rise handlebar, unlike the step through which features cruiser style swept-back handlebar. 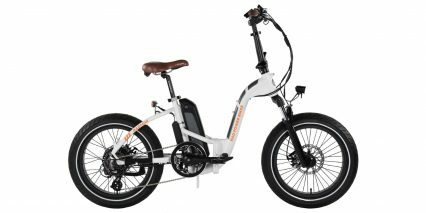 The high step version looses its color options (now only comes in a dark silver with gray and orange accents), and gains a little weight (2lbs to be exact) at 63lbs. 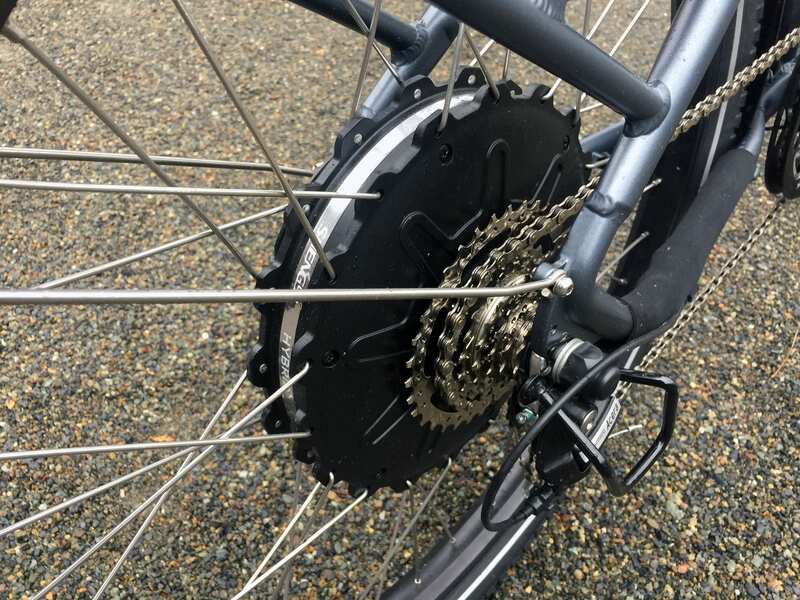 The drivetrain received an update with a 7 speed 11-34 tooth freewheel which is a lot better than 14-28, giving you a wider range of gears to pedal through. A good upgrade to the bike is the nickel plated DNP freewheel which not only shifts smoothly, but will hold up better over time. You also get a 46 tooth chain ring up front. 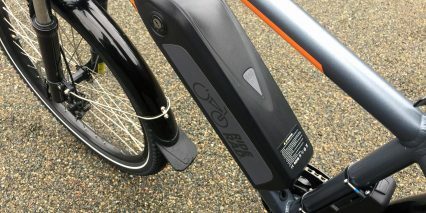 I am excited to see a fully battery integrated front and rear lights. The front light is a Spanninga Axendo and features an active daylight sensor. 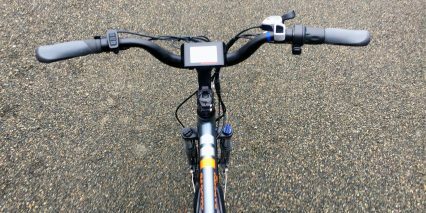 On the rear light, you have a flashing mode and the ability to function as an active break light, getting brighter as you press on the brakes. 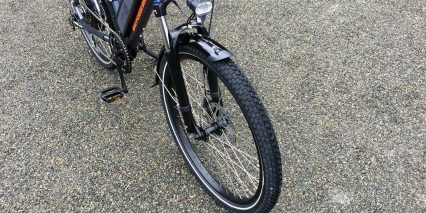 Other changes include reflective sidewall tire striping, and custom Kenda K-Shield puncture resistant tires. 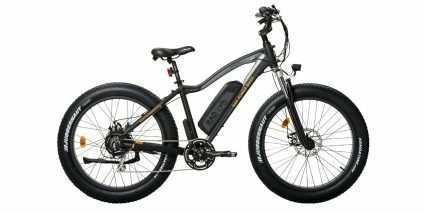 The front suspension is a SR Suntour spring fork both with hydraulic lockout and preload adjustment settings. Plastic fenders are included along with rubber mud flaps which helps alleviate toe strikes. 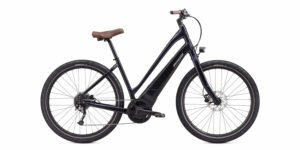 For stopping power, the RadCity comes with 180mm mechanical Tektro Aries disc brakes. That is a bit of a tradeoff there, it would have been nice to see some hydraulic disc brakes since you have to squeeze a little harder to get the mechanical brakes to stop effectively, however, Rad Power points out that mechanical brakes keep maintenance costs down and are easier to adjust which is true. 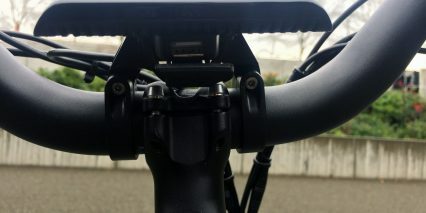 One thing they did add to the brakes though are these conical washers on the mounting points which make it even easier to adjust and also bring down some of that bake squeaking that we all have to deal with from time to time. 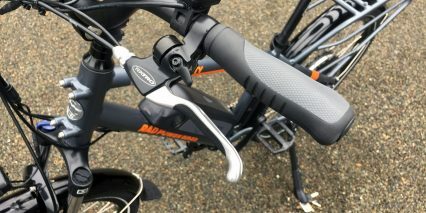 Some other nice features include non locking ergonomic grips, an integrated bell, Wellgo aluminum alloy platform pedals, prxowheel crank arm, slap guard on the right chain stay, and some cool badges and logos. A lot of configurability is built into the RadCity. 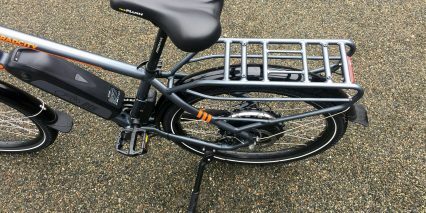 The rear rack is well designed for Rad Power Bikes official accessories, or your own via bungie loops, hangers for panniers, window for Yepp! Child seat, or even threaded eyelets for mounting bigger racks. 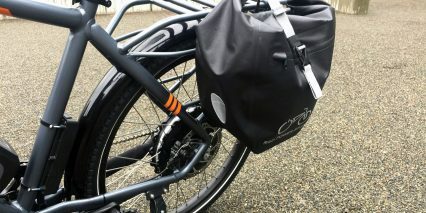 On the down tube, there are bottle cage bosses mounted out of the way at the bottom that you could even use for a mini pump or a folding lock. 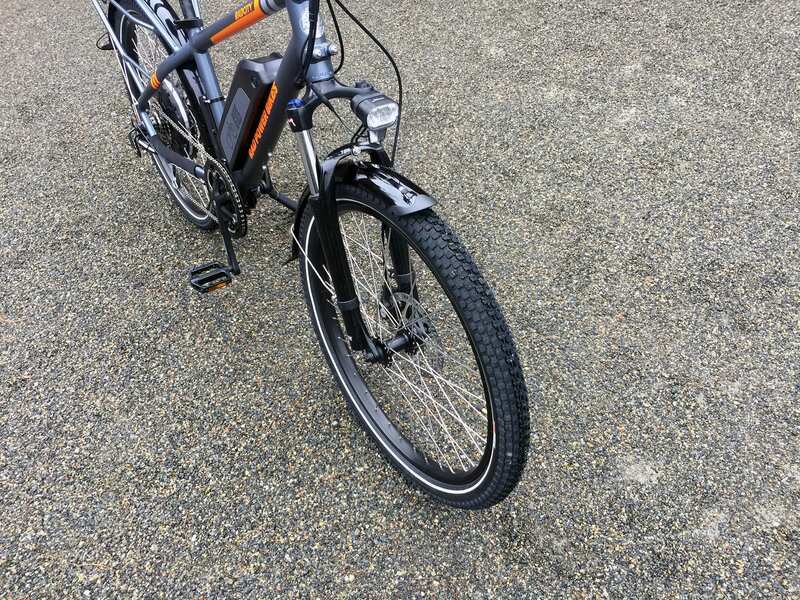 In the front there is an option for a frame bolted front rack so it wont tip or shift as you are steering the bike. 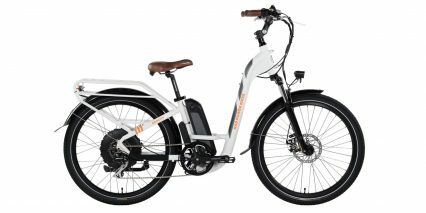 Maximum loading capacity on the bike is a generous 275, making it versatile for a number of uses. 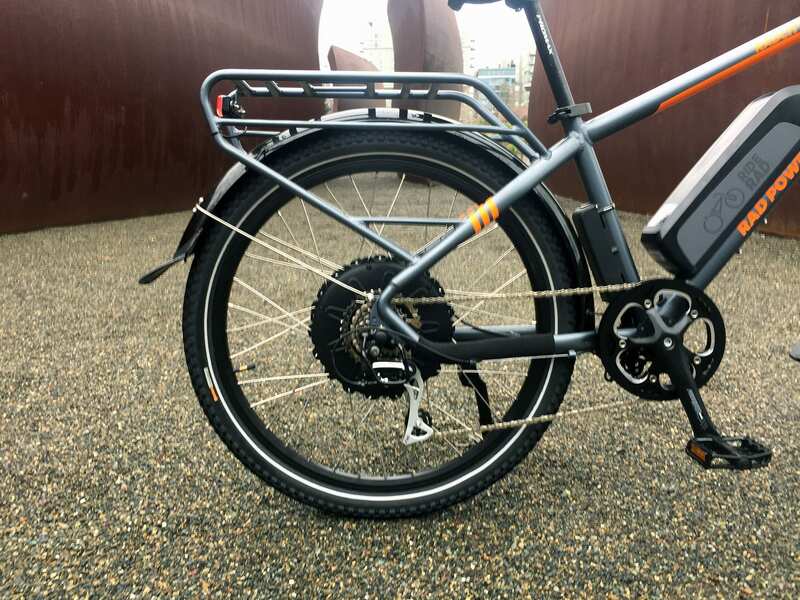 Supporting the load is 12 gage thick spokes which add strength if you load up the rack with weight. 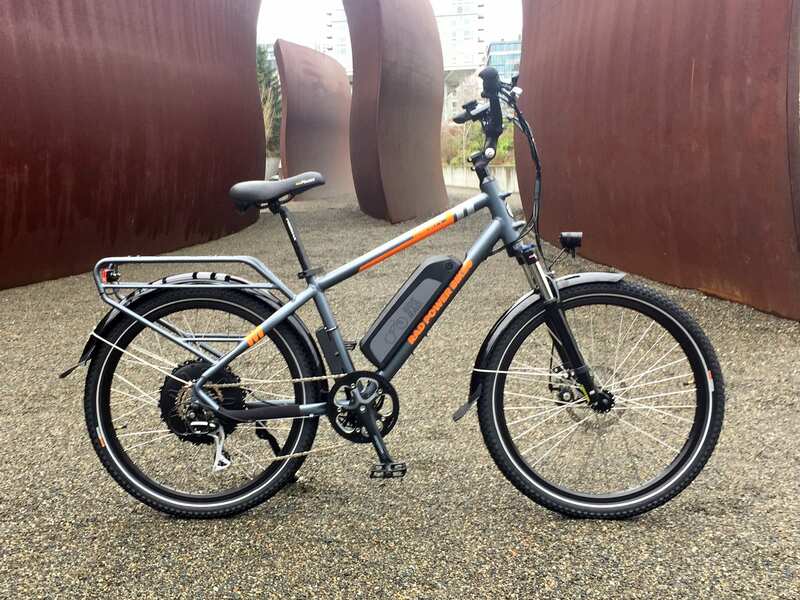 Driving this ebike is a a Shengyi gearless hub motor that weighs ~15lbs and is spoked into a sturdy double-wall Weinmann rim with extra-thick 12 gauge spokes. Gearless motors need to be larger, and are usually heavier, because they produce power through electromagnetic staters and rare earth magnets pushing against each other. The further out those magnets are, the more leverage the staters can get when pushing them. 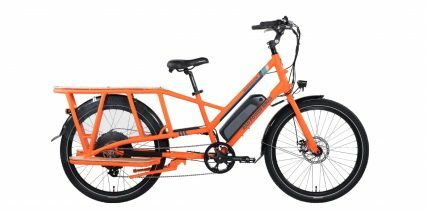 The advantages are that you don’t have plastic gears rubbing against each other to produce power through reduction gearing and this keeps it quiet and more durable over the long run. 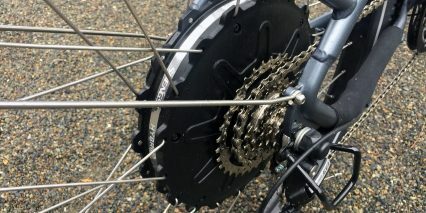 When the motor pushes, it propels the bike forward through the axle mounted to the rear dropouts, and in this case it’s a thicker 12mm axle with 10mm flat spacing. 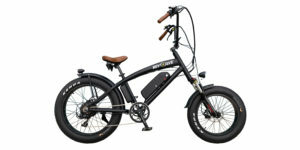 Rad Power Bikes has reinforced the rear dropouts by adding a stainless steel torque arm on the left droput so that the Aluminum alloy frame won’t get bent and widen as the motor pushes against it. 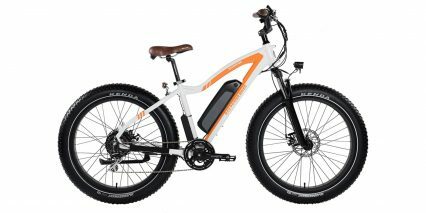 The motor pushes one way when you apply power and then the other way when you activate regenerative braking. One drawback to this type of motor is a bit of magnetic drag that is produced because there is no freewheel, a feature that geared motors offer (but they don’t have regen). 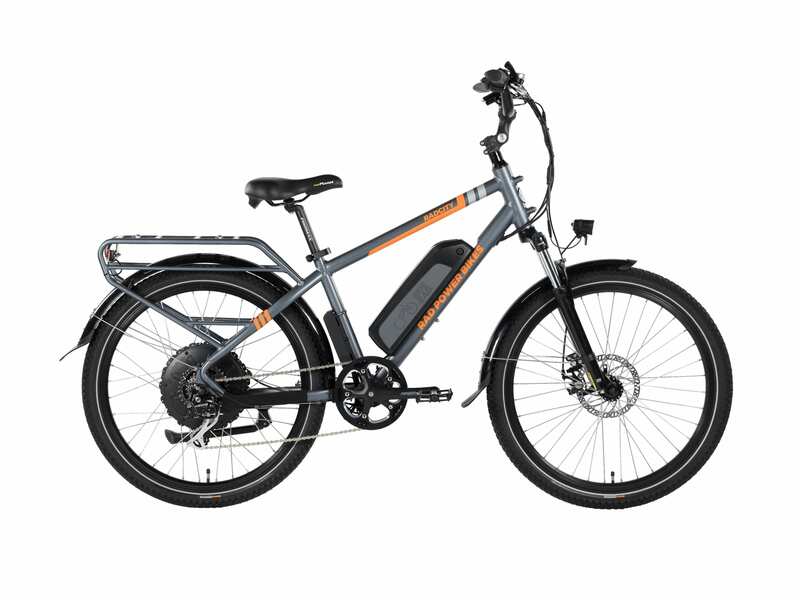 In short, this motor is quiet, tough, and very capable as long as you have some speed going. 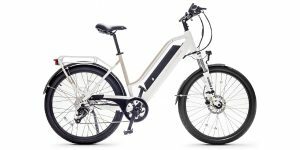 It can take a moment to get up to speed, but it feels smooth and is fairly responsive thanks to the upgraded 12-magnet cadence sensor. 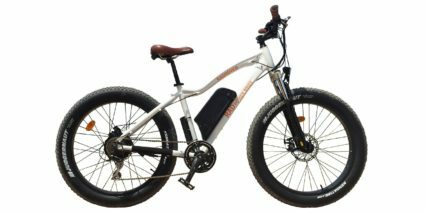 Powering the RadCity is the same 48 volt 14 amp hour Lithium-ion battery pack. 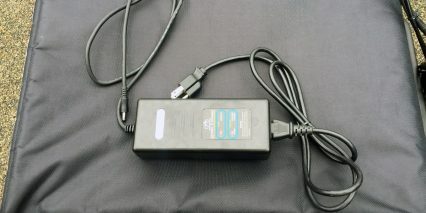 This pack uses Samsung 35E cells which are more energy dense (and thus space saving) than more generic or cheaper cells. 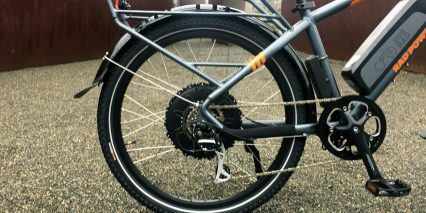 The pack mounts onto the downtube in a sturdy plastic slide with three bolts that really keep it secure. 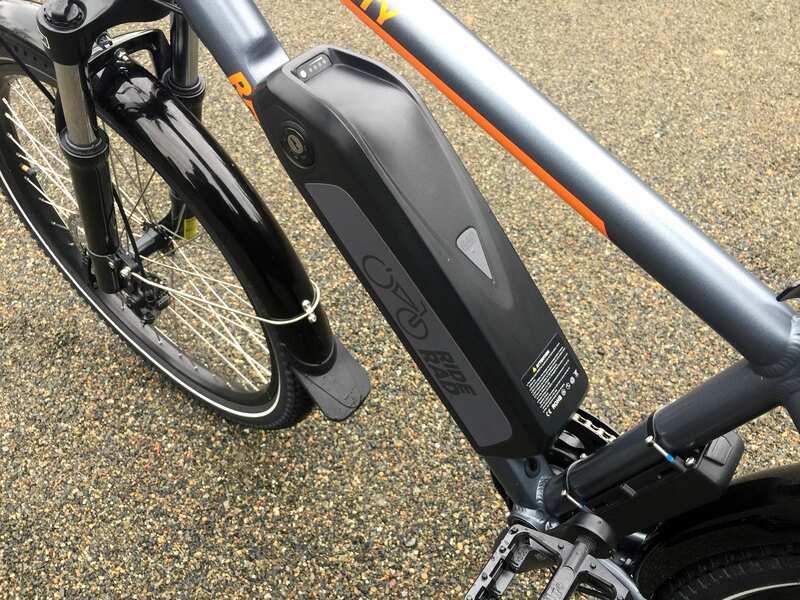 I like that the downtube has been flattened out where the battery mount is positioned because this probably offers a larger contact point and will reduce rattling over time. 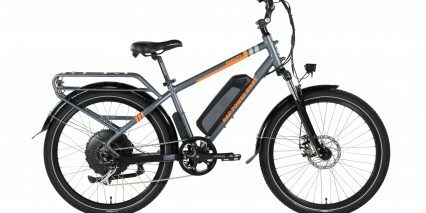 You can charge the battery when it’s mounted or take it off, which is handy for commuting, but the charger is pretty basic. It’s lightweight at ~1.1lbs, and very compact, but only delivers 2 Amps which makes for a ~6 hour charge time if the battery is completely emptied. 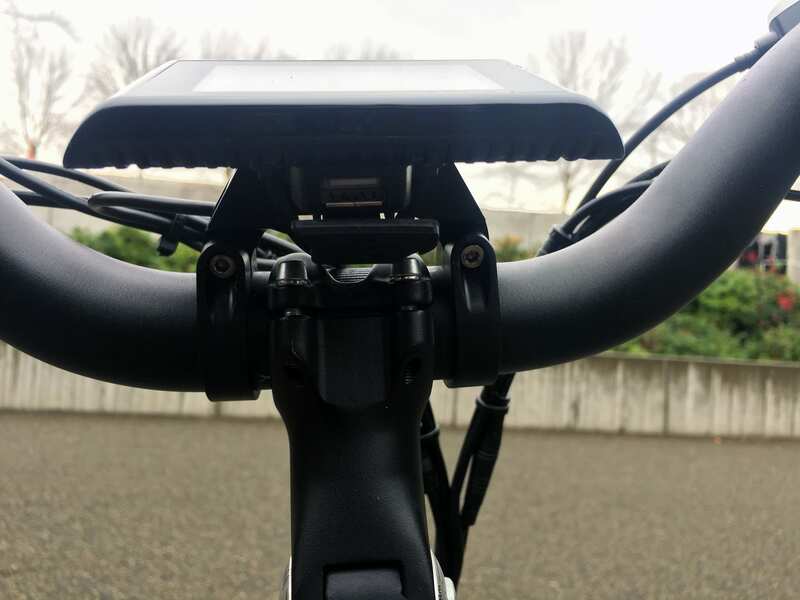 The charging port for this pack is up high, out of the way of the right crank arm, and has an easy-to-use rubber cap to protect it. The underside of the battery has two fuses which are designed to prevent damage and fires, and they are replaceable so you can try to diagnose and maintain the battery for years to come. 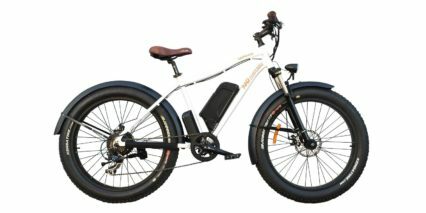 Since most of the new models all use this custom battery pack, it should be very easy to get replacement or additional packs and I believe the price is just $499 (which is great compared to many other mainstream ebike batteries I see for $800 to $900). On the left side of the battery, there’s a metal key slot that allows you to lock it to the frame in an off or on position. 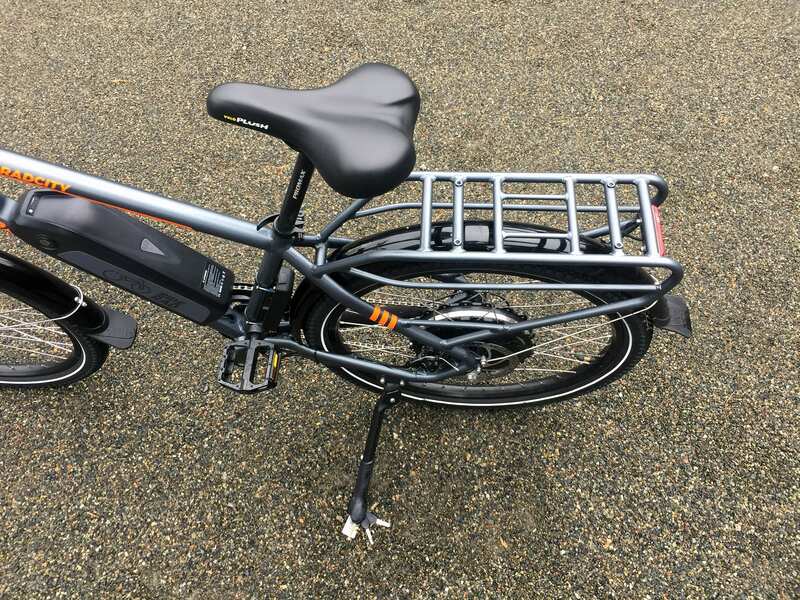 It’s great that you cannot ride the bike until the battery is fully secured and locked! I have heard of people riding off without locking their packs and having a very sad, expensive day when it falls off and breaks. So, locking it in the off position is great because nobody can tamper with your display and throttle fi you are parked outside at a public rack. The display panel is largely unchanged from previous generations and that’s a good thing. The major drawback for me has always been that it is not removable and will thus be exposed to more weather and scratches over time, but that’s not at all uncommon. I love how large and easy to read it is. The LCD panel is greyscale with good contrast and has a backlighting feature that comes on when you activate the headlight (by holding up and Mode together for a moment). The display tips forward and back to reduce glare, and is well sealed against water along with all of the accessories and external controller box. 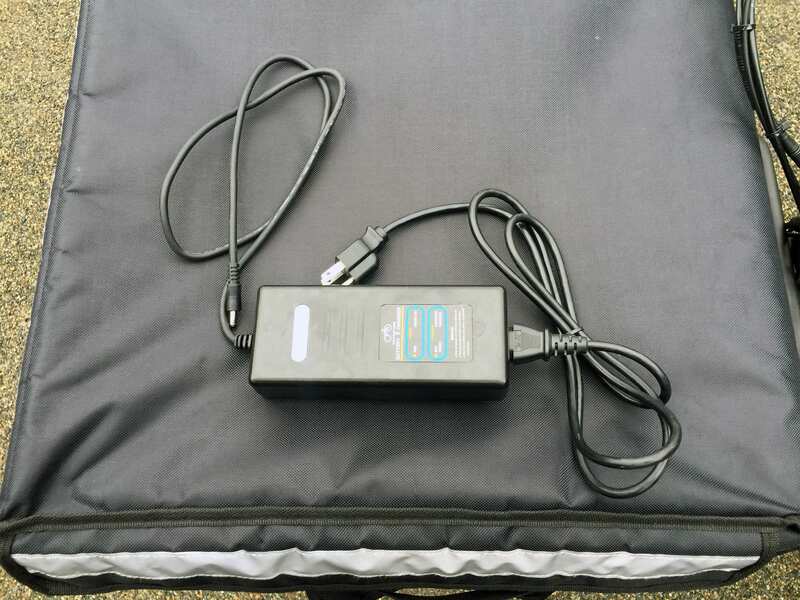 I asked about this box, why they didn’t integrated it with the battery pack, and was told that this allows batteries to be less expensive to replace and that the controller can be more powerful and less prone to heat issues when packed within the battery or mount. That makes a lot of sense to me and I think they positioned the controller well, just behind the seat tube and protected by the back fender. Eventually, when you need to clean the bike off or if it gets salty or is muddy, you should be able to hose it down lightly and use a rag. Rain, shallow puddles, and light rinsing is all okay according to RPB but you don’t want to spray it hard or submerge anything but the tires and lower portion of the rims. So anyway, once the battery pack has been charged, mounted, and the ignition has been turned to on, you just hold the Mode button and the display activates. 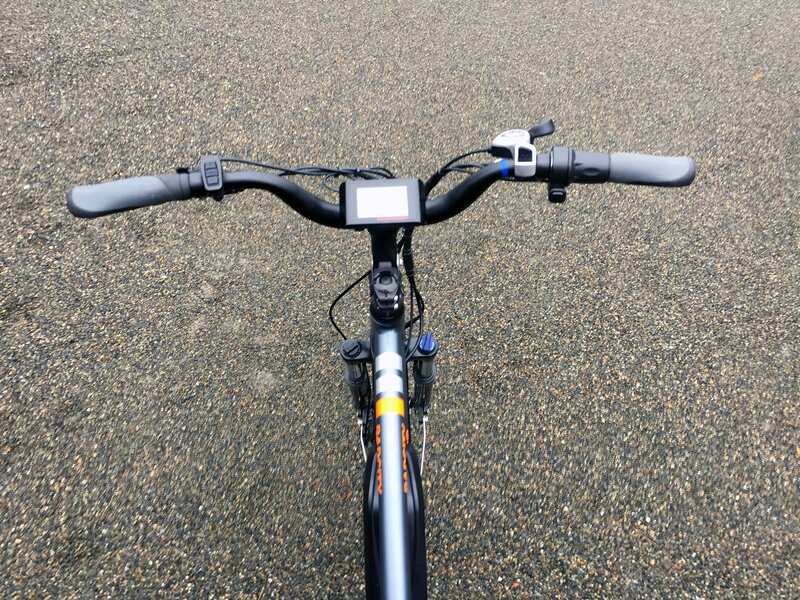 At this time, you’ll be in assist level 1 and can start pedaling for a small amount of assist or use the throttle for up to full assist if you twist all the way. 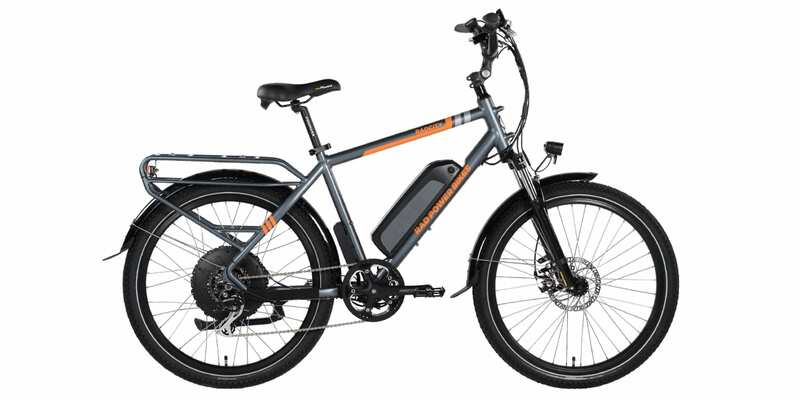 I love that the throttle is completely open, because some ebikes limit throttle output based on the chosen level of assist, and for me this sort of defeats the purpose. The throttle even works in level zero, if you arrow down to it, and that turns this into more of a scooter where pedaling won’t accidentally switch the motor on. You can also completely de-activate the throttle and use this for pedal assist only. 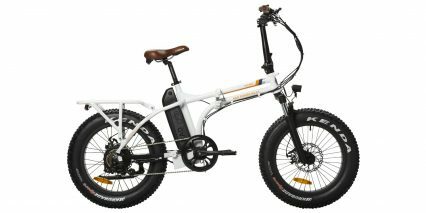 I should say that Rad Power Bikes is obeying European and Canadian laws, offering different motor powers (500 watt in Canada specifically) and has a licensing class in the UK for legal use. I love the changes across the Rad Power lineup this year, and one of the things that makes this changes so cool is that so many of the modules are cross compatible. 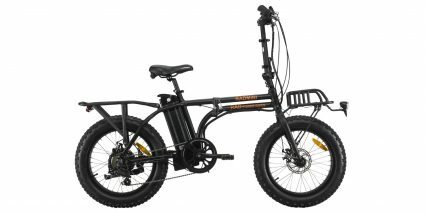 For example, let’s say you have a RadCity and a RadWagon with a suspension seat and you want to take out the RadCity for a long weekend ride. 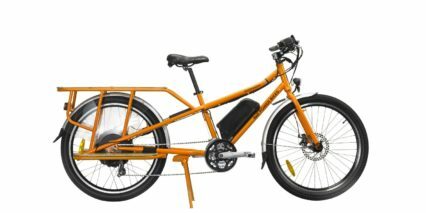 You can take the battery and the suspension seat from the RadWagon and use them for your weekend trip on the RadCity! 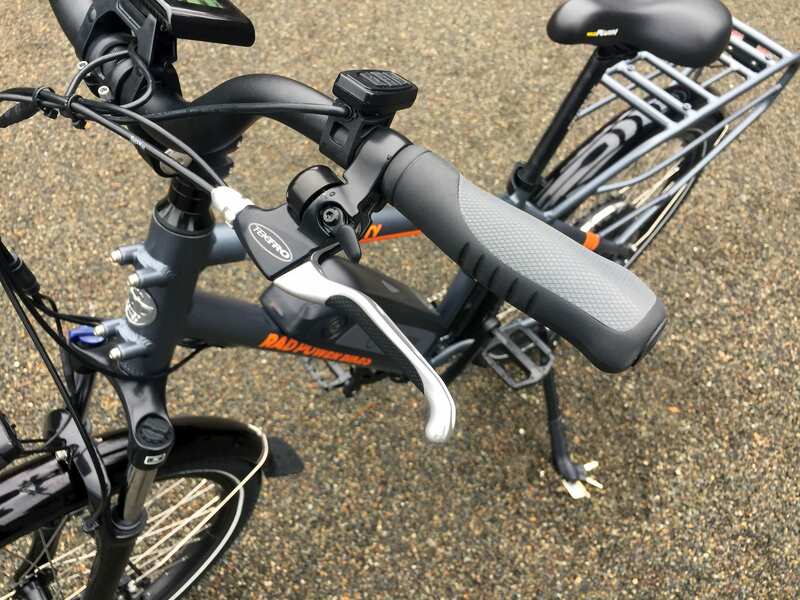 I should also mention the seat post clamp here, it is nice and big so if it is cold or you got gloves on, you’re not going to hurt your fingers raising or lowering your seat. 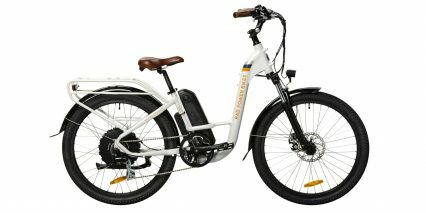 Also having interchangeable parts between bikes keeps cost down, both for the purchase of the bike and for replacing parts. It was great to ride this around and see so many other RadCity bikes in action from real people and companies in the streets of Seattle. 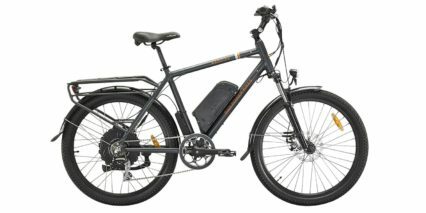 Clearly many are proving the practicality of this bike with the many accessories offered through Rad Power Bikes. 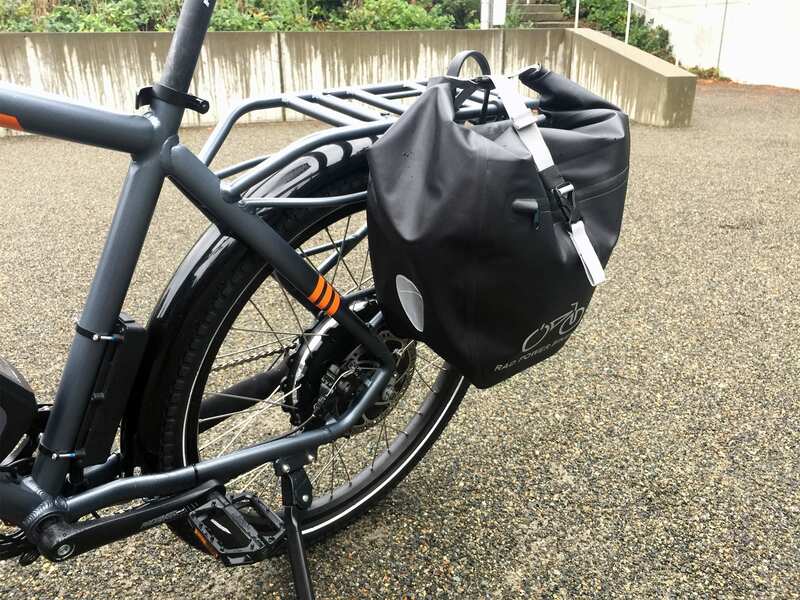 Basket bags work great, and we even got to see some insulated delivery bags in action. 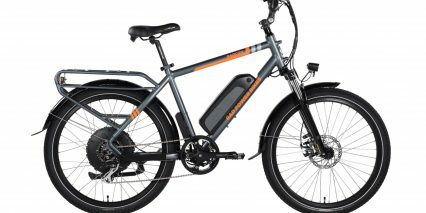 And it is hard to talk about any Rad Power bike without mentioning its great value price point ($1,499 for the RadCity) and its 1 year warranty and fantastic support team. 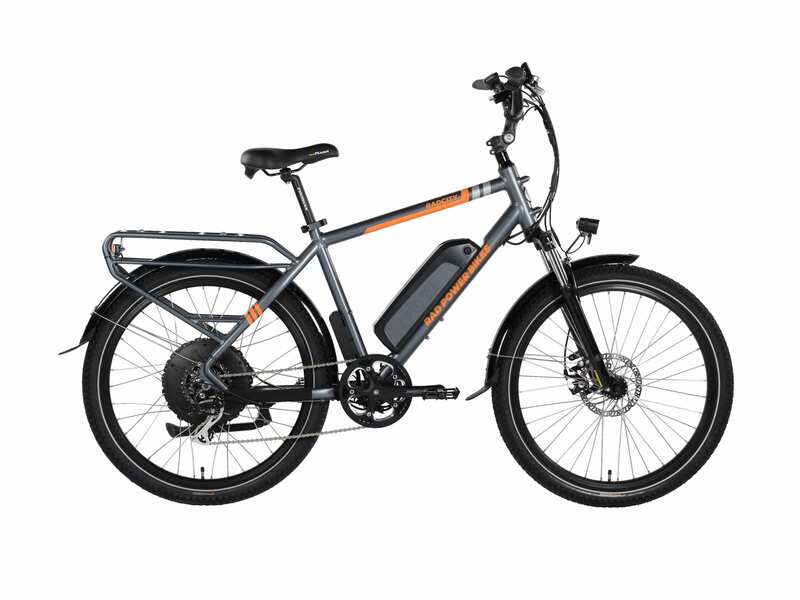 The notable tradeoffs for this commuter would be the absence of hydraulic brakes, and the magnetic drag from the gearless motor. The motor is also not as zippy as a geared motor, but it definitely provides a quiet smoothness. Another tradeoff is the non-removable display. It is water resistant which is great, but still there are other worries for an exposed display other than just rain. Also, the RadCity Step-Thru gets a color option, but this high step version does not. 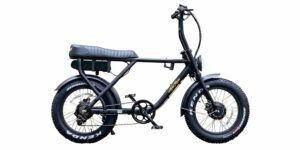 At the end of the day, there is so much practicality packed into one package its hard not to see the RadCity working for your urban needs. It is no small wonder there are so many of these running around for both commuters and companies alike. 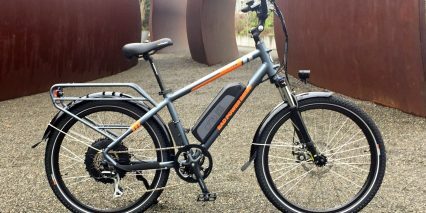 I would like to personally thank Rad Power Bikes for inviting me to Seattle to put these bikes through their paces. If you have a RadCity, or if you have questions, comments, or stories you would like to share, please visit our forums and tell us all about it, we would love to hear from you. I am the owner of three Rads. All 2017 models. A City, a Rover and a Mini. I would rate them as at least four stars out of five. That’s a bit low, as a matter of fact. Let’s call it nine stars out of ten. Maybe I don’t need to write a whole lot about their virtues. In sum, they’re well made and they have all the strength I need. 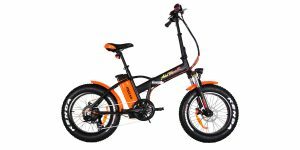 I have a long history as a manual bicycle rider. So I’m fairly strong on my own. 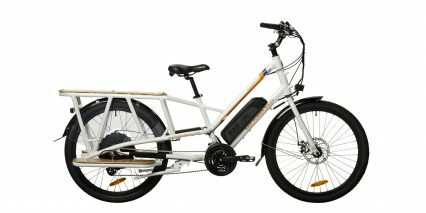 But I can also tell that these bikes have the strength needed for those who’ve not been riding a regular bicycle all these years. Between the three bikes I have now had two minor component failures. One LCD display and one wiring harness. 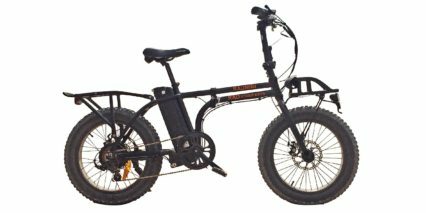 The one that runs from the handlebars to the drive-train. In both cases diagnosis of the actual trouble needed only a bit of thought and experimentation. One item of note; Rad Powerbikes online manuals and instructions are excellent and they will help other owners diagnose and fix those ailments that do occur in the real world. Once when corresponding with Rad I suggested that maybe a few components could be upgraded. Yet I might have been mistaken with that. It could well be that no electronics will stand against the elements as well as steel does. 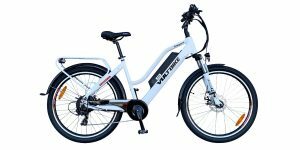 Rad Powerbikes was excellent about helpful advice and getting me replacement parts very quickly. 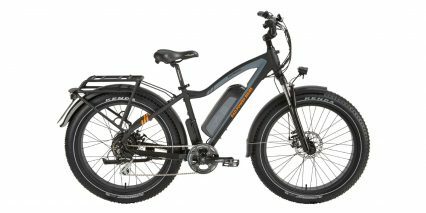 I’ll bet there are other good e-bikes out there. But I’m confident that getting a Rad will not be a mistake. 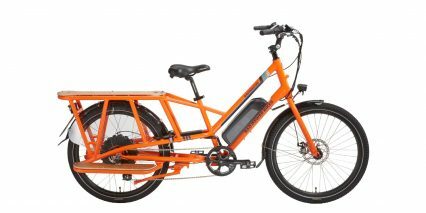 Will this ever be available in Europe ? Hi Rory! 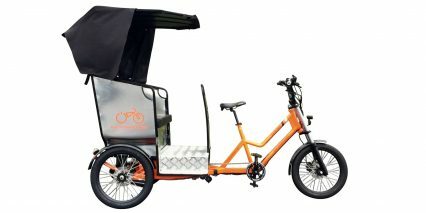 My guess is that eventually they will bring RadCity models in to Europe, but for now it seems like just the RadRhino and Euro RadWagon. I got to film those during my last RAD visit, but have been holding them for a while, not sure when they will go live?